Keep Philadelphia Beautiful is dedicated to building and sustaining vibrant communities, and our work in Philadelphia wouldn’t be possible without the support of our volunteers. We’re always in need of skilled and general volunteers. Keep Philadelphia Beautiful is committed to educating the next generation of Philadelphians about the importance of environmental stewardship and civic engagement. Schools, teachers, and passionate education supporters: learn more about our in-classroom workshops under our Programs tab. -Volunteer Educators: We offer no-cost in-classroom workshops on litter, recycling, and composting for elementary, middle, and high school students. 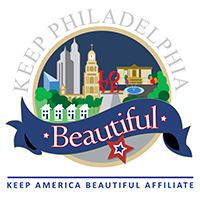 If you’re interested in volunteering for Keep Philadelphia Beautiful to help bring our presentations into Philadelphia schools, please email kelly@keepphiladelphiabeautiful.org. Keep Philadelphia Beautiful helps neighborhood based organizations and individuals to plan and execute community beautification events. For support with volunteer recruitment, marketing, supplies, city government programs and partner identification, reach out to us directly at info@keepphiladelphiabeautiful.org. –Community Cleanup Volunteer: Sign-up here for our volunteer list and be notified of community beautification events, whether through Keep Philadelphia Beautiful or one of our partner organizations. –Corporate Cleanup Volunteer: Partner with Keep Philadelphia Beautiful to organize a cleanup work-day for your employees. E-mail kelly@keepphiladelphiabeautiful.org with your organization name and address, group size, and preferred work dates, and we’ll follow-up with next steps. If you don’t see a volunteer opportunity listed that aligns with your skills or needs, please e-mail info@keepphiladelphiabeautiful.org and let us know what you have in mind!